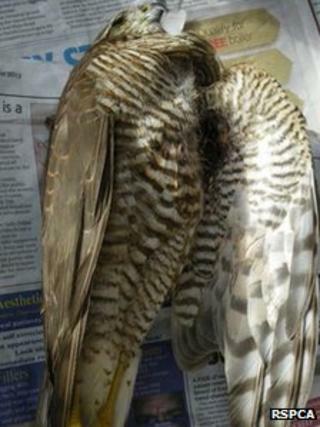 The RSPCA has called the killing of a sparrowhawk in Wrexham "despicable". They say the bird of prey, a protected species, was probably shot in flight as the wound was found beneath its wing. A member of the public found the sparrowhawk, initially reported to be a kestral, injured in Brynhyfryd, Johnstown, on Thursday but it later died of its injuries. "Shooting any creature in this way is a completely despicable act," said RSPCA chief inspector Helen Mead. "I'd urge anyone who knows anything about this incident to get in touch immediately." Anyone found guilty under the Wildlife and Countryside Act 1981 could face a £5,000 fine and six months in jail. Witnesses have been asked to call the RSPCA cruelty and information line on 0300 1234 999.